I’m always looking for ways to get in and out of the kitchen fast. My favorite way to do this is to plan and freeze meals ahead of time. I have a list of freeze ahead meals that I reach for often. But, on days the freezer is empty, I pull out recipe ideas that are quick! 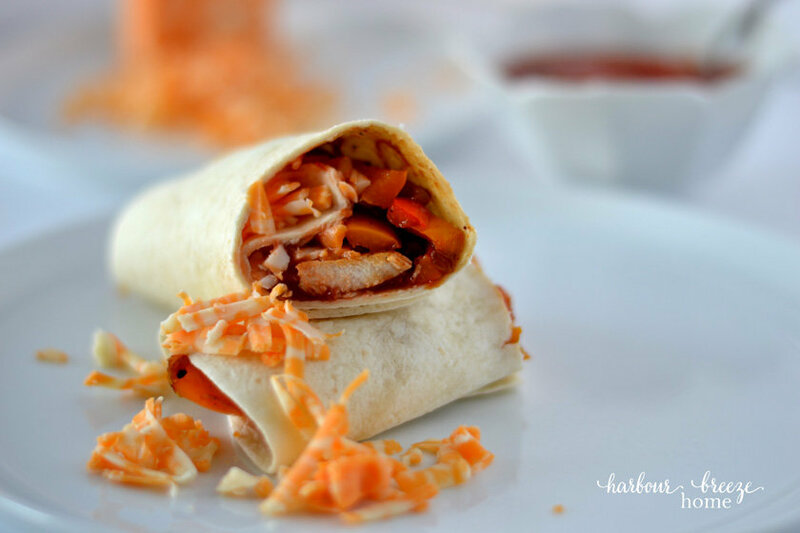 These Chicken and Pepper Fajita Wraps are one of them. They’re easy to prepare and are filled with amazing flavour. 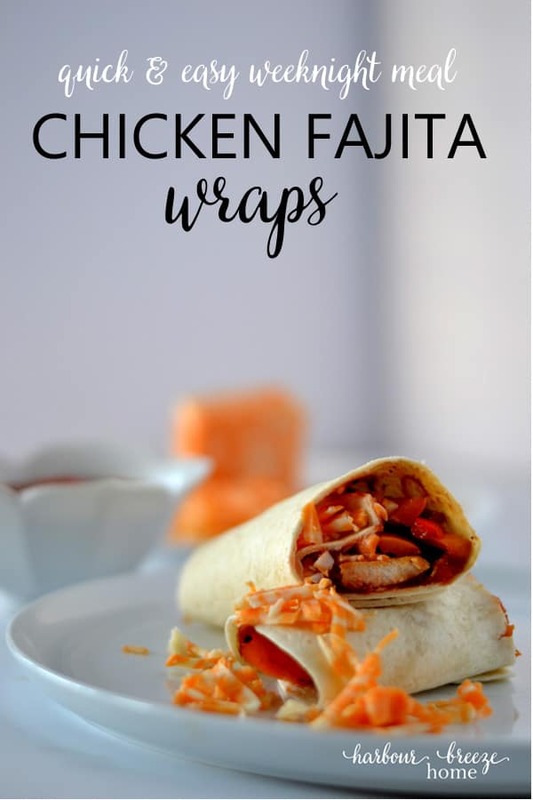 Chicken and Pepper Fajita Wraps are also a great recipe to use when entertaining guests. It’s a casual dinner party idea, and can be easily adapted for special dietary needs. 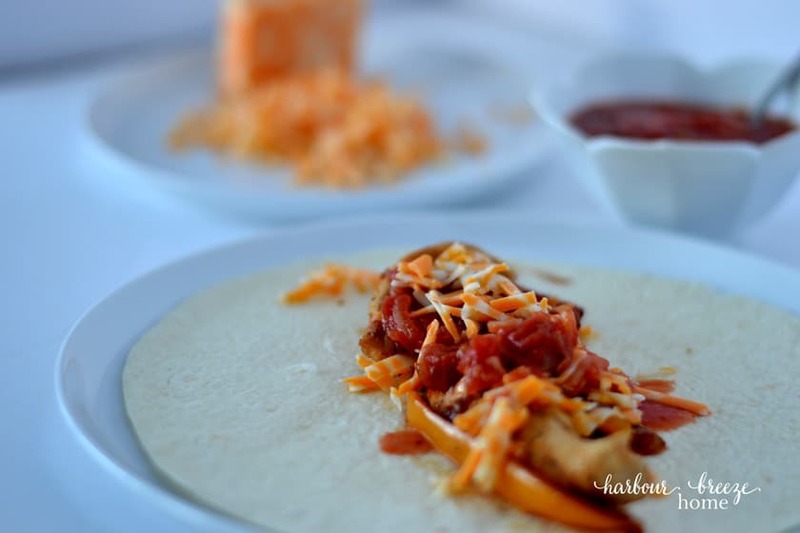 All the toppings and wraps can be served separately so each guest can customize their meal! Slice the peppers, onions, and chicken into thin strips. 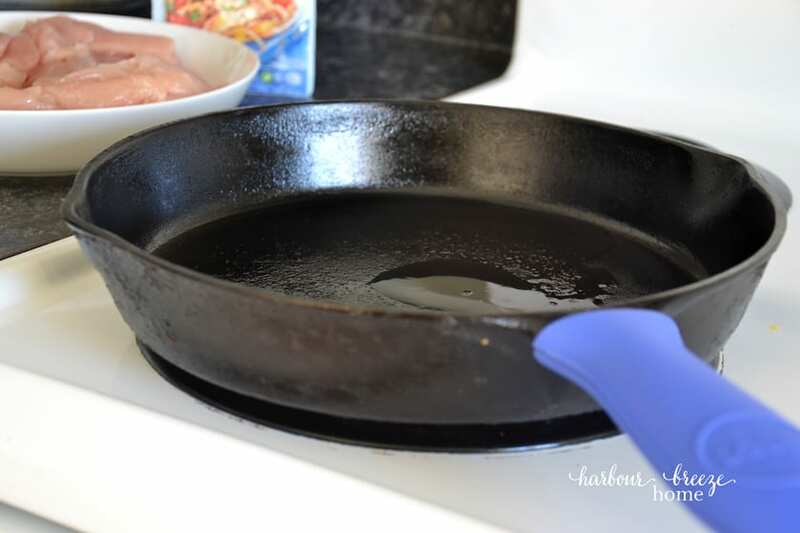 Although this recipe can certainly be made in any type of pan, I prefer to use a cast iron one. It seems to make the whole meal even more flavorful, and I love how the chicken turns out when cooked this way. Cooking with a cast iron pan has a bit of a learning curve. It took me a while to figure out a few key steps. The first one is to pour in about 2 Tablespoons oil, and let it heat up on medium high heat before adding the chicken. It should make a “sizzle” sound when the meat is placed in the pan. The second helpful cast iron tip I discovered was to place the meat in the pan in a single layer. Lay it in piece by piece, and then don’t touch it for a few minutes. It will cook and get a lovely crispy coating on it, making it easy to lift and turn over. Salt and pepper the chicken. Turn it over once you see it starting to turn white around the edges. Continue cooking until it is cooked through. 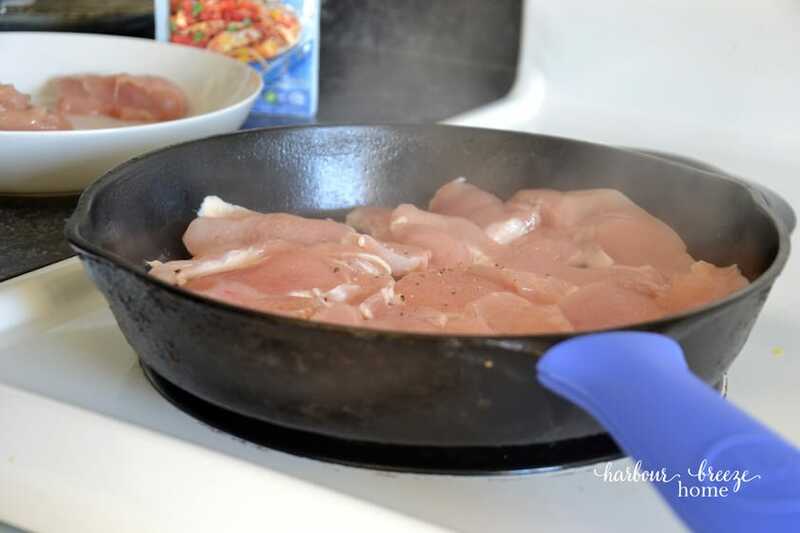 Once the first batch of chicken is completely cooked through, remove it from the pan and place in a clean dish. Repeat the process with the rest of the chicken and add it to the first batch of chicken in the clean dish. Once the chicken has been removed from the cast iron pan, pour in all the sliced peppers and onions. Stir it around quickly, as the pan will be well heated by now. If the pan seems to be too dry and starting to burn on the bottom, pour in a little bit of water (3 Tablespoons), and scrape off the bits from the bottom. Season with salt and pepper as you saute. 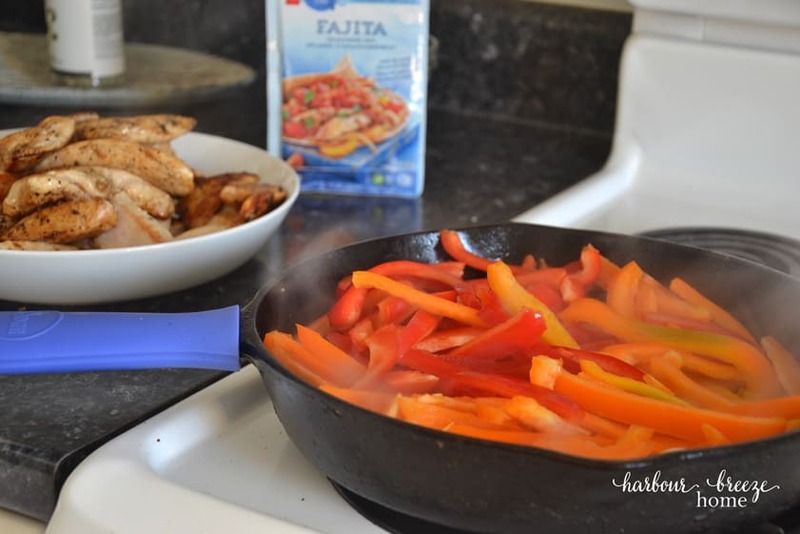 Once the vegetables have reached a crisp-tender stage, add in the chicken and the package of fajita seasoning mix. Pour over 1/4 cup of water and stir well. Simmer together on low heat for about 20 minutes to get a nice flavour ~ stirring occasionally to prevent burning on the bottom. 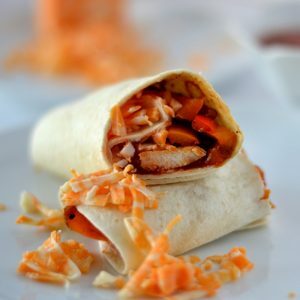 Once the Chicken & Pepper Fajita filling is cooked, it will be ready to eat! Spoon in the preferred amount of filling into the center of a flour tortilla. Add whatever toppings you prefer such as salsa, grated cheddar cheese, shredded lettuce, diced tomatoes, and sour cream. Roll it up, and there you have it! I like to serve this for guests with a large lazy susan in the middle of the table. The filling and all the toppings can be placed there and easily accessible for guests to twirl and choose. It’s such a fun dinner idea! Thinly slice the peppers, onion, and chicken breasts. Heat 3 Tbls. oil in a cast iron pan over medium high heat. Once the pan is hot, cook the chicken pieces in single layers. Removing each layer once it is cooked and placing it in a clean dish. When all the chicken has been cooked, add the peppers and onion to the hot pan. Stir and add a bit of water if the pan seems dry. Saute the veggies until they are crisp tender. Salt and pepper to taste. Add the cooked chicken to the veggies in the cast iron pan. 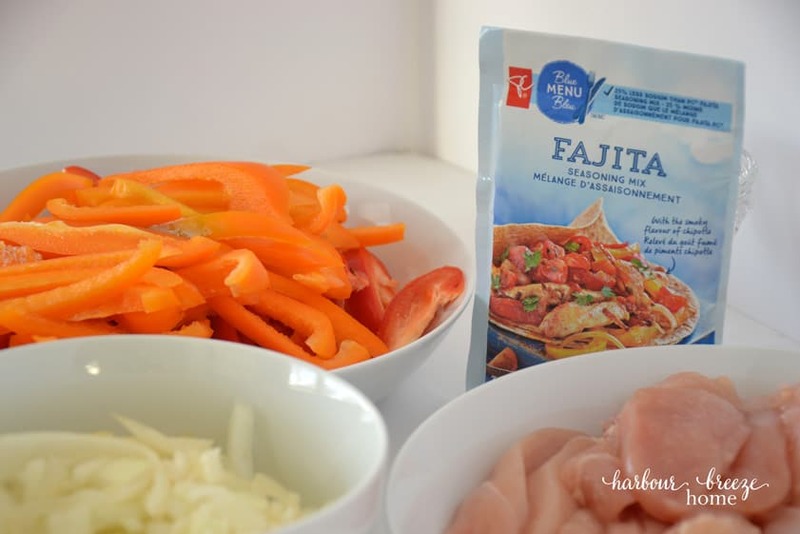 Pour the contents of the fajita seasoning package onto the chicken and vegetables and add ¼ cup water. Add toppings of choice such as grated cheese, salsa, sour cream and diced tomatoes.